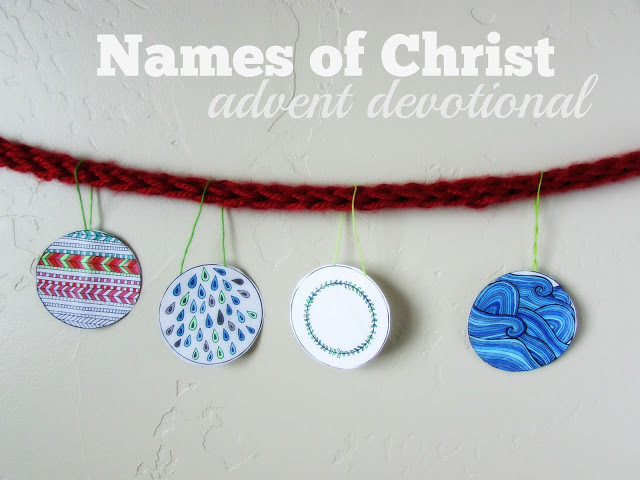 My friend Heidi at A Lively Hope put together this beautiful Names of Christ Advent Devotional. 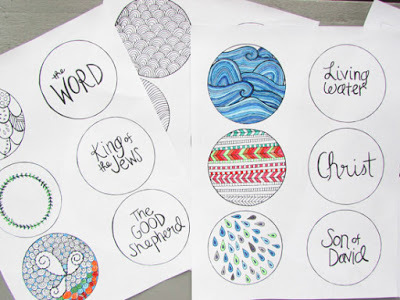 For each day leading up to Christmas she has created a stunning hand drawn ornament that corresponds to one of the names of Christ. Each day of advent you read a short excerpt of scripture that highlights a different name of Jesus Christ and then color and cut out the corresponding ornament to hang on your Christmas tree or another special place. She has also included discussion questions for each day to help you have a meaningful study of each of Christ's names. Heidi sent me a copy of the devotional and I am really excited to start it with my kids in a few days. 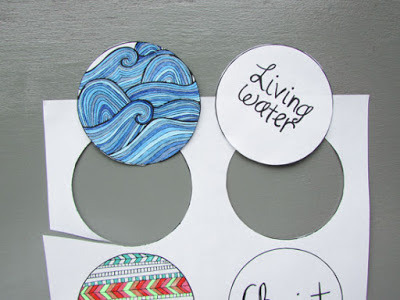 She has made it really easy to do a simple activity every day of December to help make the Christmas season more Christ-centered rather than gift- centered. I am especially appreciative of all her hard work this year-- when being rather big and pregnant and not full of much energy-- I am really grateful for things that require minimal preparation on my part, but which engage and teach my children. Yet, even if you don't have children to teach this would be an awesome personal or couple scriptures study to do as well. One that could really become a cherished Christmas tradition. 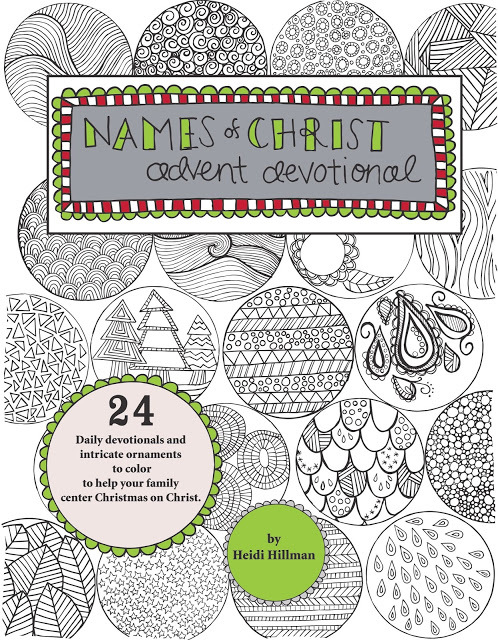 Heidi is giving away two free copies of her Names of Christ Advent Devotional to two of my fortunate readers. I know that we only have a few days left till December begins and so the giveaway isn't going to be open for long. Make sure you enter now so you get a chance to win, or just save yourself the anticipation and go buy the download from her website! Loved it when the kids were still home with me (growing up and moving on) , and we'd place a piece of straw in a manger for a good deed done. To prepare a place in our home (and our hearts) for the baby Jesus to come. We have ornaments with verses of the Christmas story written on each one. Before opening presents we take turns picking an ornament and reading the verse before hanging it on the tree. We make a cake and sing happy birthday to Jesus! We have an advent binder I created with a Christ-focused scripture passage, a Christmas story from a Church magazine, and a Christmas carol that we read (and sing) together as a family every night from December 1 through Christmas Eve. On Christmas Eve everyone opens a special gift that will help them build their relationship with the Savior. Sometimes it is a gratitude journal, a picture to hang on the wall, this year everyone is getting kneeling pads for prayers because we just moved to a new house with all tile floors. ;). I love that we can have these gifts before all the chaos of Christmas morning and talk reverently about how to know Christ better. There is an old-time radio show series that we listen to starting the Sunday after Thanksgiving. It's called The Cinnamon Bear. I found a list of scriptures to read for the 12 days before Christmas in an old New Era from my youth. I love the focus on Cheist that it brings to my holiday season. We watch church videos (Mormon message) every night about the Savior. We have a family friendly nativity and we love setting it out and talking about each person on the nativity. I love going to christmas church! Reading and discussing stories of Jesus each FHE in December has been great for our family! Oh we need this! I love to go to church for a special Christmas service on the day. Singing the carols/hymns on Christmas morning with other people is wonderful. We always read the story of the birth of the Savior on Christmas Eve--before any presents are opened or other non-religious traditions happen. We have a big Christmas party and we sing the religious Christmas carols loudly, accompanied by my son on the piano. It's one of my favorite times of the season with the lights twinkling and all of our voices raised. For our Christ centered Christmas tradition, we read from a sweet little homemade book each night until Christmas. This brings in the spirit and helps us feel closer to the Savior. My favorite Christmas tradition is my has been reading the book the littlest Angel to us. My favorite Christ centered tradition is we have an advent calendar that tells the stories of Christ's life and Resurrection. Every day we read a different story, miracle or aspect of his life. It's awesome! My favorite Christ centered tradition is watching the LDS movies of the nativity story. My in laws like to read Luke 2 with just the adults and have us discuss. My husband is the organist right now too so I get live Christmas music everyday. We have a Birthday party for Jesus. Our gift to Him is a few things we commit to improve about ourselves during the year. We write them down and put it in a box under our tree. The funnest part is reading our commitments from years past to see our progress. I love singing the Christmas hymns, all season long, and then on Christmas Eve right before reading the Christmas story from the bible. I love singing the Christmas hymns at Church for the whole month. About a decade ago my husband compiled scriptures from all the standard works into a reading that starts with the prophecies of Christ's birth & continues through His life. It is about an hour long but we read it every Christmas. We also spend the day in service to our community, visit our neighbors & have the missionaries over for dinner. The only gift giving that we do on Christmas is our gift to the Christ child where we write down what we will work on in the coming year as our gift to Him. We do not open our other gifts until after Christmas so that we can focus on Christ for the day. Even when we had small children we did this and they loved it! As a kid it was sleeping under the lighted tree the first night we set it up. As an adult my favorite tradition is singing Christmas hymns. I love visiting temple lights if we are close enough during the season. As a child we had a manger with a baby doll. When we did service we put a piece of straw in the manger. The goal was to give the baby Jesus a nice soft place to sleep by the time Christmas Day came. We have one of the children read the Christmas story from the Bible before we eat. I did this as a child with my parents, my mom did this as a child with her parents. Reading Luke 2 as a family on Christmas Eve is one of our favorites. We have a book of christmas stories for each day in December that corresponds to a scripture.